Takes a bit of practice how to use (ie how much to apply) but leaves the hair well moisturised and soft. I am still waiting to use the conditioner but if the fragrance and ingredients are anything to go on, the conditioning effects should be excellent. This product saved my dried out hair...Love it. Great product especially when travelling, very economical to use will last for ages. Il balsamo non è semplicissimo da usare, ma ha un prufumo stupendo. Best conditioner for dry hair I have been able to find. Long lasting and easy to use. Makes my hair silky. Fantastic product. I have previously bought a solid conditioner from a well known high street shop and I much prefer the one from funky soap. It's easier to apply and my hair feels much nicer with it. I really love this conditioner I’ve recently stopped buying the usual shampoo and conditioner, opting for a more natural product. I’ve been surprised by how easily this has gone. Thanks Funky Soap :). Love this & my hair definitely feels nicely conditioned. I find I need to add water to my hair after I’ve applied it but it’s great. Not sure if I'm using it wrong but it takes another was with shampoo to get the conditioner out of my hair.. won't come out by simply rinsing it. Exactly what i hoped for. A really effective natural conditioner and no plastic bottle! It certainly seems like a little goes a long way, so i think it will end up being good value for money too. i am planning on buying them for my sisters and gilrfriends now as pressies. I had an allergic reaction to it (itchy scalp) and it made my hair look greasy. Have used other conditioner bars from other brands and never had an experience like this! Fabulous conditioner. Rub through hair and leave for a minute or two and your hair is like silk. A must have and I’ve packed some for my holidays too. This didn’t work like conditioner at all. 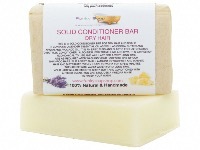 Amazing conditioner bar ,I love it. It makes my hair soft and shiny. Really love this product, leaves my curly hair soft and glossy. Added bonus of no plastic packaging which I am kean to move away from. Definitely converted. Very impressed, works a treat. Great, haven't experienced any problems! Conditions well, with very little needed. Really impressed with the quality of the Funkysoap shampoo and conditioner. Both come completely plastic free. The scent of the shampoo bar is lovely. It washes my hair thoroughly and doesn't leave it feeling dry like some shampoo bars. The conditioner bar is also excellent at giving my hair the same silky feel and look I used to get with a castor oil based conditioner. I would highly recommend Funkysoap for the quality and ethical consciousness put into their products. Works wonderfully on my long curly hair which tends to get dry and frizzy. First time I used it my hair was left very greasy - as if I haven’t washed it in months. But I thought that it’s just my hair getting used to it. Three more times - the same situation and unfortunately I threw the bar to the bin... Maybe not for me. Sceptical how this would work but my goodness, it's awesome! Has left my dry course curly hair feeling soft and managable. Love this, makes my hair feel and look amazing! Love this stuff! Acts just like normal conditioner, if not better, with the added benefit of being all natural ingredients. Lasts a little bit longer than liquid conditioner too. Great for frizzy hair, leaves it curly and shiny with a lovely fresh fragrance.